In this passage from John's Gospel, Jesus Christ dying on the Cross tells "the disciple" to behold his Mother, the Blessed Virgin Mary. It seems that Jesus is referring to John, but the actual words are "the disciple." And so, in that moment, Mary becomes Mother of all disciples of Jesus, including those in our own time who follow Jesus. To quote Pope John Paul II in his 1987 encyclical Redemptoris Mater, "This is true not only of John, who at that hour stood at the foot of the Cross together with the Mother (of Jesus), but it is also true of every disciple of Christ, of every Christian (45.3)." Jesus Christ is the heart of Catholic Tradition and Christian life. Catholics celebrate the Mass, read the Bible, and receive the Seven Sacraments. In the Mass we share in the one Sacrifice on the Cross of our Lord Jesus Christ, as we await his Second Coming. In the Eucharist the Church is as it were at the foot of the Cross with Mary. Receiving Holy Communion with others during the Sacrifice of the Mass brings unity of the Church, the Body of Christ. Three of our favorite prayers are the Lord's Prayer, the Our Father, the Hail Mary (or Ave Maria), and the Rosary. The Our Father is the prayer of hope given to us by Jesus himself in the Sermon on the Mount, recorded in the Gospel of Matthew (6:9-13). The Scriptural basis for the Hail Mary is from the Gospel of Luke (1:26-42). 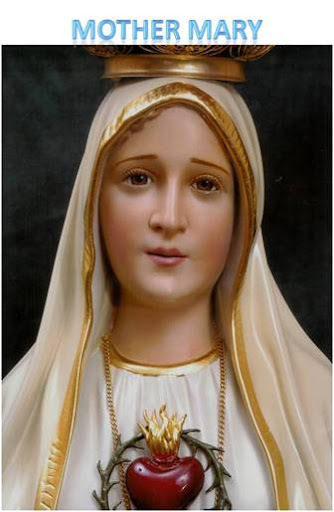 The Blessed Virgin Mary is the Mother of Jesus Christ, the Son of God (Mark 1:1, Acts 9:20, Romans 1:4). As Jesus is both God and man, Mary is the Mother of God (Luke 1:43). Her intercessory role in the second part of the prayer is based on her mediation at the wedding feast of Cana, recorded in the Gospel of John (2:1-12). The Rosary is a Biblical account of the life of Jesus. who intercedes with her Son Jesus for us, her children on earth.